The best way to eat Aamla or Amla is to eat it raw (with the least loss of vitamin C). In India it is commonly added to the chutneys. 1 tablespoonful of Aamla or Amla juice and honey taken every morning promotes vigor and vitality and is useful in preserving eyesight. 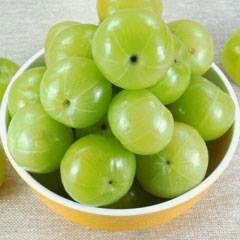 Aamla or Amla helps reduce blood sugar in diabetics. 1 tablespoonful of Aamla or Amla juice mixed with one cup of bitter gourd juice, if taken early morning for two months, can control blood sugar. Aamla or Amla is considered an effective remedy for heart disease. Aamla or Amla is helpful in tuberculosis of lungs, asthma, and bronchitis. Aamla or Amla helps enriching hair growth and hair pigmentation. Aamla or Amla improves immunity and protects from common cough and cold.